Whenever you look through a party magazine or any newspaper, you'll find these amazing photos of set tables filled with beautiful products and props and delicious foods to make the photo look great, don't you always think to yourself, how do they do that and how can i do the same? Well, we're going to show you and tell you how simple it is to set up your table for your next party, event of even holiday with your friends and family. We've put together a photo-shoot and made a small video clip to show you how simple it is to put this together and make it look like you had a party designer just for you! 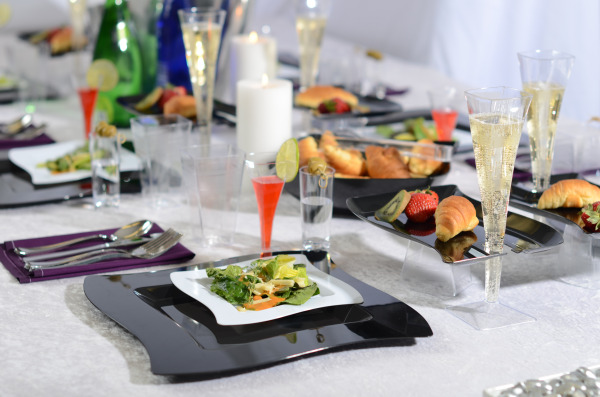 Another thing you always think of is the cost of the expensive tableware, fancy plates and glasses could bring up the cost of any event quite significant, that's where we recommend you to use these amazing upscale disposable dinnerware, we feature the most amazing, most elegant premium plastic designer tableware for your party or any event, it will beet the real china dishes in every way! Look at the cost, it is unmatchable the price differences, look at the cleaning up after the party, who wants to stand and wash dishes for an hour or 2 after the party? not me! With these dishes you just throw them into the recycling bin (they are 100% recyclable) and your party has just been cleaned up instantly, how sweet is that! You choose from different colors to match your scheme of the party, there are Black, White, Bone/Ivory or clear partyware to be used or any and every style event or party. Here is the video we put together for you to see how easy it is to get the professional table look with using only disposable tableware. In this photo shoot we used the below items, click on each link and it will take you to the page on our website, so you can see for yourself the many other options available for you to choose and use. Here's the money shot you will see in your upscale magazine or Food and Beverage Catalog only! Enjoy yourself while trying to recreate the setting and we'd love to see and hear how you did and perhaps teach us a thing or 2 how a table should be set.